On March 9, 1983, an American engineer named Chuck (Charles) Hull had created the world’s first 3D printer. It was something of a crude design that he called stereolithography (SLA or SL). It was the first device of its kind to print a real physical part. Hull couldn’t have known back then what amazing potential his invention would have on the world. Today, 3D printing is an integral part of so many wide-ranging industries. Still, it’s the medical applications that are making so many experts sit up and pay attention. On the scope of things, the full potential of 3D printing is still largely unknown. The good news is that research and innovation is moving ahead at an unprecedented rate. The medical industry has utilized 3D printing for over 20 years, but nothing like what we’re experiencing now. The current capability of this technology is astonishing, no one would argue with that. But it’s the potential of 3D printing (also called additive manufacturing) for human health benefit that’s getting everyone so excited. We can now print anything from dental applications to customizable, prosthetics. There’s also 3D printed skin, airway splints for infants, and lots more besides. It is the purpose of this guide to highlight the present and future benefits of medical 3D printing for humans. In this guide you will learn of the huge benefits and new advantages in 3D printing for use in the medical industry. We look into the present and future applications, and what 3D printing means for medical professionals and their patients. As the readership will be wide-ranging, the language throughout this guide is straightforward and easy to read. Although not overly technical, this is still an informative guide nonetheless. We present each section in a way that helps everyone to understand the benefits and uses of this fascinating, fast-evolving technology. Soon we’ll look into some of the medical parts 3D printers can produce. Before we do that, it’s important to have a good basic understanding of how these smart machines function. For any 3D printer to work, you have to feed it instructions on what to print. This is what we call the 3D model, which is a two-dimensional digital file created on a computer. We’ll look at 3D models in more detail in the next section. Once you’ve uploaded your digital file to the 3D printer it can begin to work its magic. Unlike normal printing, a 3D printer does not use ink or toner, but special types of materials. These materials add a new, precise layer to the design with each print cycle, thus creating 3D objects—one painstaking layer at a time. There are many different kinds of materials, and which ones get used depends on the design model. 3D printing materials include various plastics, ceramics and even some metals. Each of these materials has their good and bad points, and needs choosing with care. For these materials to work, the printer has to heat them to a semi-liquid state, which then quickly hardens as the print head moves around the design. As mentioned earlier, the 3D printer has to know what to print, so it needs an instruction file. This is the 3D model, AKA three-dimensional modeling, or blueprint. These are files that anyone can design from scratch on a regular computer using special 3D production software. These programs allow you to create an accurate 3D representation of an object’s surface area. It works by manipulating shapes (polygons, edges, and vertices) in a simulated 3D environment. It’s actually a lot easier than it sounds. You can also scan everyday objects into a set of data points which will then represent the object in digital form. The digital files used by a lot of modern 3D printers typically take the form of CAD files (Computer-Aided Design Files). OK, so that’s the basics of how a 3D printer works. Whether it’s kid’s toys or prosthetic limbs, the technology is similar. The only difference is in the quality of the machines, the materials used, and the skills of the people who design and print these objects. 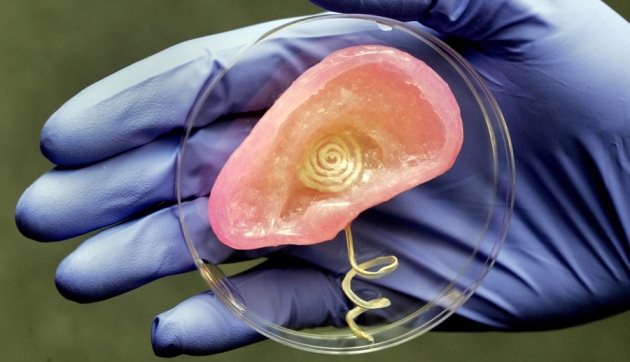 3D printing is already revolutionizing human health care on so many levels. It’s fixing people and enhancing their lives like nothing else before it. Best of all is that there’s still plenty of potential for further research and development in 3D printing for medical uses. Some things are already in use and making a real difference in people’s lives. Other designs are currently awaiting approval. It might sound like science fiction, but 3D printed organs have arrived, at least in part. Most experts predict that some printed artificial organs will make perfect replacements. Others even believe they’ll be an improvement on the human machinery, but there are limitations. At the moment, few experts feel that 3D printing will be able to yield whole, complex organs. It’s a lovely idea, but right now it’s highly improbable, at least in the near future. This is because of the complicated architectures of whole organs like livers and kidneys. Sadly, there are around 18 people who die waiting for organ transplants in the US every single day. If, or indeed when, 3D major organ printing becomes a reality, the shortage of human donated organs will become a problem of the past. When it comes to science one must never say never. Organ printing technology is developing, and developing fast. It’s not the mechanical process that’s the problem here; it’s the biological materials causing the stumbling blocks. Thermoplastics and metals used in regular 3D printing models don’t die once they’ve cooled off. Living tissue, on the other hand, is far more delicate. Right now, major artificial organ transplant is some way off. Yet there are other benefits from printing less than perfect organs that are getting scientists excited. For example, printed organs that may not be suitable for humans could still benefit drug or vaccine testing. Since the organs are ‘human’ in nature, it frees researchers from less accurate analysis. It means they don’t have to work on synthetic models or rely on animal testing as much. The exVive3D Liver Model is a great example. It’s too small to be an actual organ, but it works just like a real liver. This model lives up to 40 days, or even longer, which makes it ideal for testing things like the toxicity of new and experimental medications. This incredibly exciting 3D technology is helping to enhance surgical precision like nothing before it. In the past, teachers and professors would not let inexperienced medical students anywhere near living patients to practice their procedures. They would have to rely on a corpse (cadavers), animals, or other models with varying textures. Learning how to dissect and stitch up wounds in this way is better than nothing, but far it’s from ideal. The best way to practice would be on real people, in a proper medical setting. The good news is that things are changing, offering better solutions. This means improved training and more experience for medical students before they’re let loose on real patients. 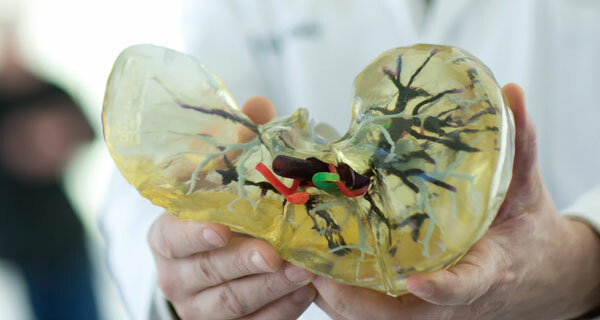 3D printed medical models also offer exciting opportunities for surgeons who want to learn new surgical procedures or train in other areas of expertise. This technology is advancing so fast it’s hard to keep up with all the new developments. A lot of this is thanks to the good doctors at the University of Rochester Medical Center, (URMC). They have discovered a way to print incredibly lifelike models of human organs and various other parts of the anatomy. They’re so realistic that these 3D models will even bleed once the scalpel makes a cut. Remember, these 3D models are so lifelike it’s hard to tell them apart from the real thing. This realistic encounter is a huge development in medical training. Students get to experience what a live situation would actually feel like. The only difference is that it’s not real, and because of this they have less pressure. Therefore, they can develop more confidence and become more accurate before working on real patients. If they make mistakes, no one dies, and the student gets to learn from the experience. According to URMC, these 3D surgical models will soon be commonplace in ‘rehearsals’ for complex surgeries. Surgeons will soon have the opportunity to create their 3D models from real patient scans. These accurate models will let them examine various health issues, including tumor growths. This alone is an enormous benefit and will help doctors improve procedures on individual patients. 3D-printable prosthetics have arrived. They’re starting to change the face of medicine as we know it. Engineers and physicians are working together to develop new-style prosthetics. These are models that become totally customized, matching the wearers exact needs. The world of prosthetics has never looked so good. In fact, 3D printing prosthetics has now become easy to do. Just about anyone with the proper equipment and the right materials can print their own artificial limbs. Globally, there are tens of millions of people missing limbs for all kinds of reasons. According to Amputee Coalition, there is somewhere around 185,000 amputations performed every single year in the US alone. And at the time of writing this guide, almost 2,000,000 people in the US currently live without a limb. Until 3D printing came along—offering affordable and highly accurate prosthetics—not everyone could afford them. Depending on the limb, the price could vary anywhere from $5,000 to $50,000, making them a luxury item for many people. Children with missing limbs are a special case. For them, they have to replace the prosthetic as they grow up. And kids being kids, they’re more likely to damage their artificial limbs than the more cautious adults. The main problem with prosthetics is that there’s no such thing as one size fits all. It’s not just the size, but every little detail has to be custom made for the wearer. Before 3D printable prosthetics came along, it could take weeks, or months even, to make a limb that worked in harmony with the person. Not only are 3D printed prosthetics more accurate, they take less time to produce and are much cheaper to buy. In other words, it’s all good. 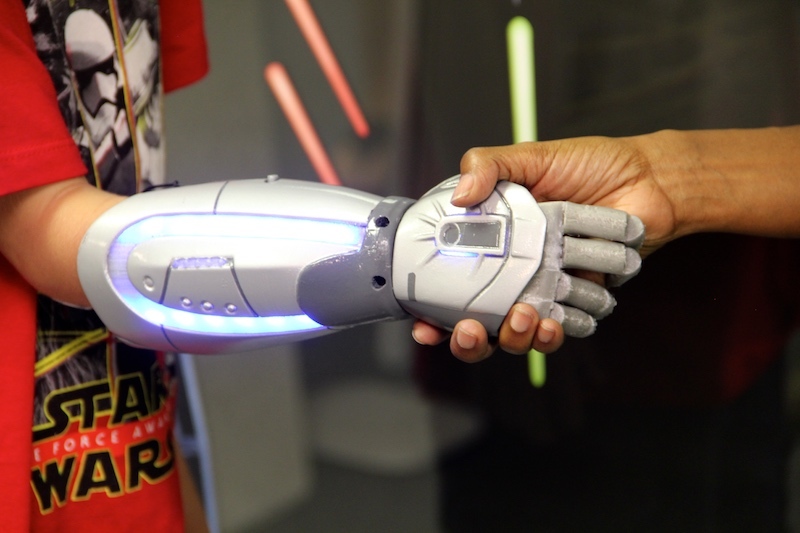 Some 3D printed limbs will go for as little as $200 or less. Creating a 3D model (digital file) and printing the prosthetic is no longer something for the experts. Today, people can make prosthetics in the comfort of home if they have all the equipment. Failing that, they can create their 3D model and give it to someone in the local community to print. This could be a regional college or local library that has a quality 3D printer on site. The point is things are changing, and that’s great news for those who might not have otherwise been able to afford a prosthetic limb. It won’t be too long before creating precision prosthetics becomes even easier than it is now. 3D scanning and new body modeling technologies are certainly the way forward. Having the option to 3D-scan limbs will result in prosthetics that are as accurate as they can possibly be. They will fit better for a start, but that’s not all. The prosthetics of the near future will also look more lifelike, and that’s huge for the wearer. Furthermore, there’s better development in the predictive movement in modern prosthetics. What this means is that people will no longer have to think so hard when controlling their artificial limbs. Again, this is a huge improvement on the prosthetics of the past. The 3D printers of today are becoming smarter and more sophisticated, yet they remain user-friendly. The good news for 3D prosthetics is that we now have printers which are compatible with a range of new materials. This includes things like lightweight titanium. Titanium provides better durability and more strength in the end product. 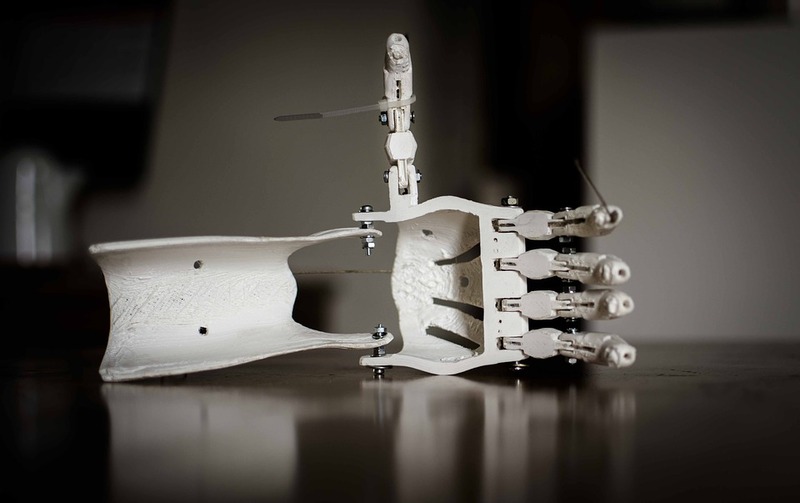 With sophisticated multi-material 3D printing processes, prosthetics are going to have added comfort. They will also have more natural sockets that harmonize with the wearer’s body. Not all prosthetics are equal, and experts will still have to create some limbs. All the same, with 3D printing technologies you can expect to get a better prosthetic at a fraction of the old costs. Remember, 3D printed prosthetics are quick to make, affordable, versatile, and more comfortable. As the technology advances, you can expect further improvements in each of these areas. Thanks to the rapid advances in 3D printed prosthetics, even our furry and feathered friends are reaping the benefits. People the world over are rescuing badly injured animals, and they seem happy to pay for 3D prosthetics so that they get back some level of mobility. This ‘care for animals’ movement is a global phenomenon and it doesn’t stop with home pet’s either. There are accounts all over the internet of good people helping helpless animals. You can read stories of ducks, sea turtles, stray dogs, wild cats, and even sheep roaming around with brand new prosthetic limbs. It’s all thanks to this amazing technology and global Samaritans. 3D printed braces, bridges, dentures, and teeth are becoming the new norm. 3D printing in dentistry has similar benefits to other health care applications. In short, it’s quick, affordable, and precise. It’s a win-win situation for both dentists and their patients. The procedural costs are lower, and the patient experience is much more comfortable. On top of this, the dental practice gets to streamline their workflow. 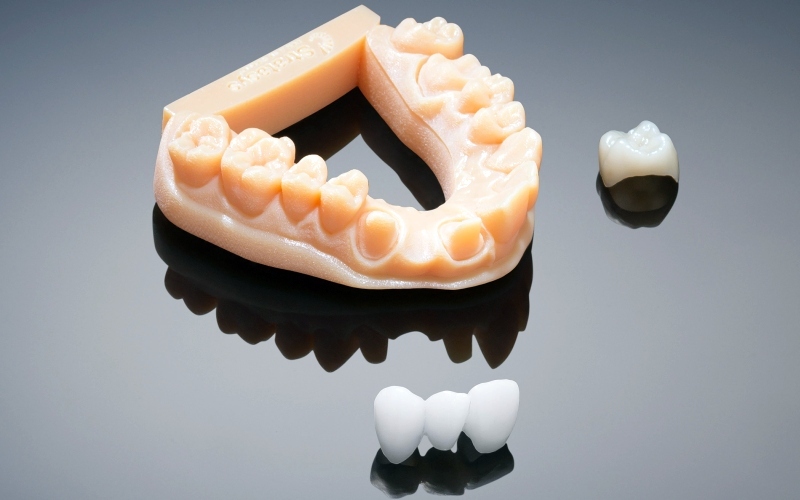 Today, dental labs can 3D print bridges, crowns, orthodontic appliances (crooked teeth and improper bites) and stone models. Now that CAD/CAM design technology is widely available, the sky really is the limit. Dentists can now produce a whole range of dental parts on site. This is great news for clients too, for obvious reasons. In general, 3D printing is a simple technology to learn, at least at the basic level. However, when it comes to 3D printing for health care, things can become more complicated, and that includes dentistry. The printing is the easy part. But to do a great job, the dentist has to also understand accurate scanning, the software, what materials to use for what application, and imaging. All these things play a crucial role, as does training and experience. Like all 3D medical printing, dental printing is gaining in popularity and use. We can expect to see a lot more 3D printing in many areas of dental maintenance and treatments over the coming years. There are still a few concerns though. More research is necessary on the use of various materials, costs, and further testing, etc. Right now, not all aspects of 3D dental printing are widespread in mainstream high-street dental practices, but it’s getting there. Every 3D medical application we’ve looked at thus far has been exciting and impressive. 3D facial reconstruction, though, offers something quite different to patients. It’s an area of 3D printing that has the potential to transform lives from the inside out, physically and mentally. Any kind of bodily disfigurement is unpleasant, but the face is a special case. People—strangers mostly—can’t help but stare at a deformed face. And the more disfigured it is, the more they look. It’s not that people are being nasty, or disrespectful, it’s just that it’s natural for the eyes to draw to anything that’s unusual and eye-catching. 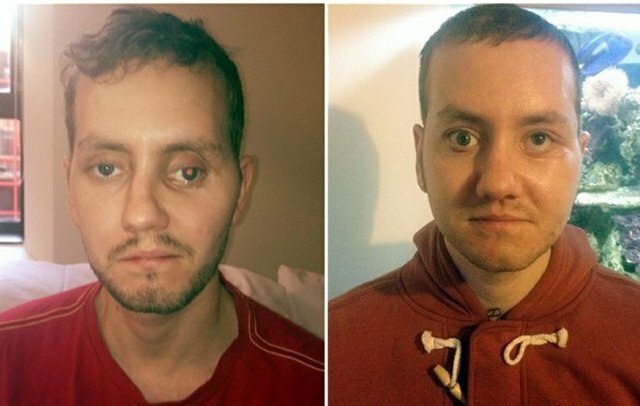 Living with a heavily disfigured face is not only upsetting, it can be traumatic too. Some people even lock themselves away indoors, only venturing out when it’s absolutely necessary. There are all kinds of reasons why someone might suffer with facial disfigurement. For our example, we’ll look at how pioneering facial reconstruction surgery helped a real person. His name is Stephen Power, and he’s from Cardiff, Wales, in The UK. Mr. Power is the lucky survivor of a serious motorcycle accident. He admits that the intricate operation he underwent was totally life-changing. He’s one of the first trauma patients to ever have 3D printing used at every phase of a surgical procedure. Printed implants per se are nothing new. Surgeons sometimes use them to correct various congenital conditions, or birth defects. The case of Stephen Power was far more complicated because there was a lot to fix. He had two broken cheekbones, a broken nose, and a broken top jaw. And if that wasn’t bad enough, he also suffered a fractured skull. The surgeon’s job was no easy feat, as they had to attempt to restore the symmetry of Mr. Power’s face. They began by taking CT scans as a way to create a symmetrical 3D model. They would then use this model to print the parts needed for the reconstruction work. Unlike the older facial reconstruction surgery, 3D printing replaces guesswork with guaranteed precision, and that’s huge. Before facial remodeling could begin, surgeons had to re-fracture both cheek bones with cutting guides. They then inserted a special, medical-grade titanium implant to hold everything in place. The new shape was eventually set and the operation came to an end. The procedure, in this case, took around eight hours to complete. The end results amazed both the surgical team and the patient. He looked almost the same as before the accident. The surgical team agreed that 3D printed parts had taken facial reconstruction procedures to a whole new level. Science fiction is fast becoming a reality. This time it’s the advances in 3D technology to print human ears and bones. So why is this making headline news? Well, it’s never easy to get tissues and organs from donors, especially when someone needs them in a hurry. This can mean patients remain sick, deformed, or even die waiting, depending on the condition. With any luck, 3D human tissue engineering (TE) is going to put a stop to all this suffering. Being able to print bone, ear tissue, and muscle is nothing short of remarkable. Researchers at Wake Forest University in North Carolina have been working hard in this area. They even have a machine called the ‘Bone Printer,” which takes care of the entire process. It’s a 3D printer that is capable of creating human parts that could soon replace real ones. Scientists have to optimize a special kind of ink that contains actual human cells. The crucial thing here is that the “ink” has to hold together and remain consistent throughout the printing process. To keep the printed parts alive, the artificial substance must allow nutrients and oxygen in from the body. 3D medical printers for artificial tissue are similar in concept to other types of 3D printers. They have a computer-controlled spout or, nozzle, which extrudes materials in controlled layers. These layers harden as they build up and eventually present the end product. What’s so different with tissue engineered 3D printing is the material it uses. Regular 3D printers used molten plastics of some kind, or various metals. The Wake Forest University 3D printer uses something quite different. Their material contains hydrogels. These are basically water-based solutions that comprise real human cells. The printers are also multi-nozzle—they have to be. The nozzles need to extrude other biodegradable materials along with hydrogels. In more layman’s terms, it’s a mixture of substances that when combined gives the tissue its strength and structure. In tests on mice, the implanted artificial tissue allowed blood vessels to grow into it. Unlike previous testing, this new material did not disintegrate, and that’s a major leap forward. We’ve already looked at the advances in major organ transplants in this guide. Despite the huge progress in this area, the technology is still some way off. 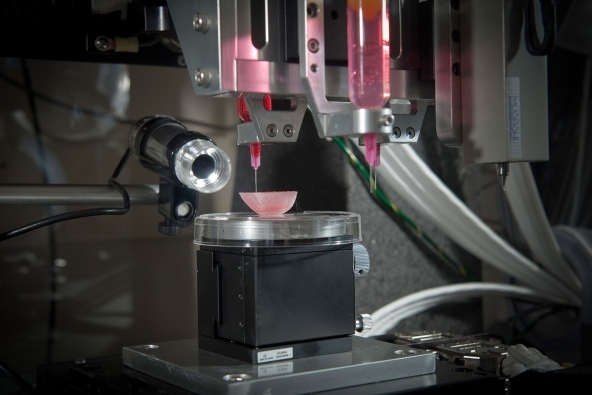 Bioprinted tissue transplants aren’t with us yet either, but it’s nearer than fully-functional organs. There’s no reason to doubt that sometime in the not too distant future, we’ll have access to 3D printers that produce body parts on demand. 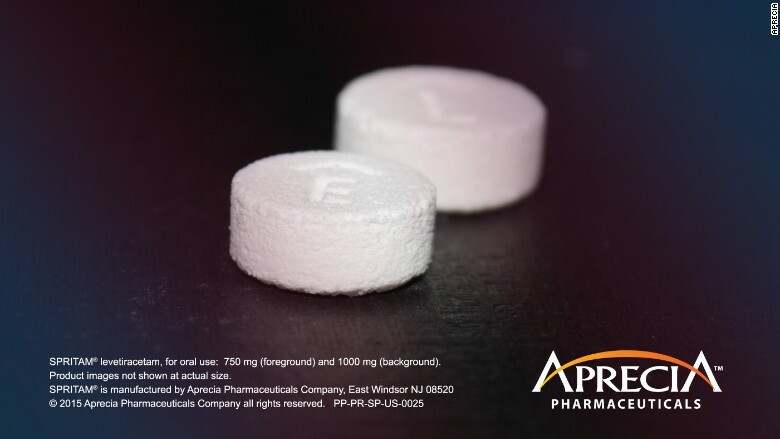 Last year, 2016, the U.S. Food and Drug Administration, or FDA, approved the first ever 3D printed drug. The drug in question is Spritam (levetiracetam). These are tablets used in the treatment of epilepsy. There are currently other pharmaceuticals in the 3D pipeline too. Now, you may wonder what the big deal is? What’s the difference between 3D printed drugs and those created in more conventional ways? In truth, there’s no increased efficiency printing drugs in 3D. Where the benefits come into play is the way 3D printing can manipulate the drugs composition. Traditional methods use the fixed and fast, press-and-die technology. Another potential benefit is that 3D drug printing could one day produce bespoke medications. There’s also the potential for custom drugs; special formulations based on the specific needs of an individual. This would put an end to the one-size-fits all approach to prescription medicine. Finally, another aim of 3D printed drugs is to produce tablets which are easier to swallow. They could also have more control on how fast or how slow they release into the system, depending on the purpose of the medicine. As pointed out in this guide, there’s still some way to go in the research and development of 3D medical printing. The anticipated annual growth rate is around 18.3% and it is expected to stay like this until 2020. When you consider how fast things are already progressing, the future potential of 3D printing for medical purpose is huge. Human tissue engineering is perhaps one of the most exciting areas of research, but then there’s so much potential in so many areas. Creating new body parts for humans was once the stuff of science fiction, but that was then and this is now. Thanks to the advances in 3D medical printing, obtaining body parts on demand is fast becoming a reality. Right now there are restrictions, but research and future development will reveal a lot more—sooner, rather than later.